State Ballet of Siberia dancer Yuri Kudriavstev. Courtesy Siberian Swan. 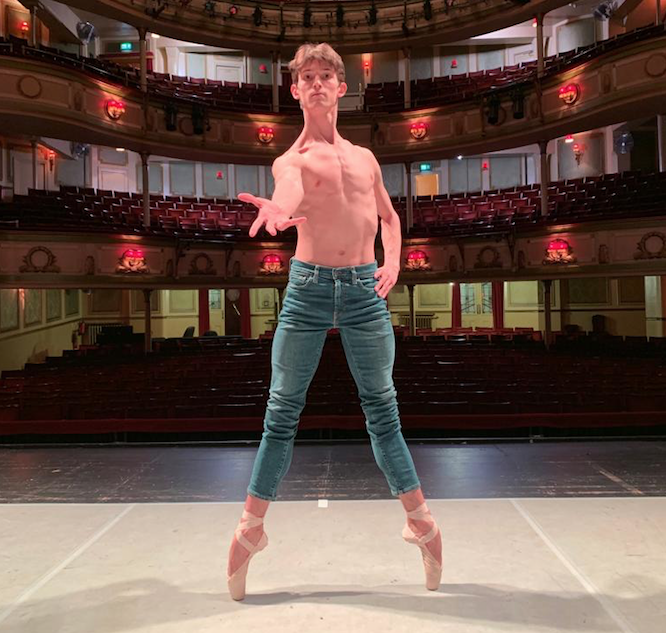 As ballet's gender roles grow increasingly blurred, more men than ever are reaching new heights: the tips of their toes. It's no longer just Les Ballets Trockadero de Monte Carlo and the few pointe-clad male character parts, like in Cinderella or Alexei Ratmansky's The Bright Stream. Some male dancers are starting to experiment with pointe shoes to strengthen their feet or expand their artistry. Michelle Dorrance even challenged the men in her cast at American Ballet Theatre to perform on pointe last season (although only Tyler Maloney ended up actually doing it onstage). The one problem? Pointe shoes have traditionally only been designed for women. Until now. A Russian company called Siberian Swan has just announced the debut of the first pointe shoe model specifically designed for men, named "Rudolf" (after Nureyev, of course). It will be released next month, giving men an alternative to custom orders. Research shows that aside from being significantly longer on average, male feet are typically wider at the ball, instep and heel. Yet the heights of the ankle bones, instep and toes can be shorter. Men's feet are also typically less flexible, and they often support more weight. So you can't simply make bigger pointe shoes and stick them on—they need a different design altogether to ensure a proper fit. The Rudolf takes this into account, with a roomy box, medium-high vamp, a wide platform and medium profile. The shanks, made of plastic, are designed to support longer, less flexible feet, with options for medium, hard or super-hard strengths. It's all the brain child of two former Bolshoi Ballet dancers who launched Siberian Swan three years ago to support the needs of their company, the State Ballet of Siberia. They since realized there was international demand beyond their studio. Case in, well, point: Even though the Rudolf has not yet been officially released, it already has dozens of pre-orders.